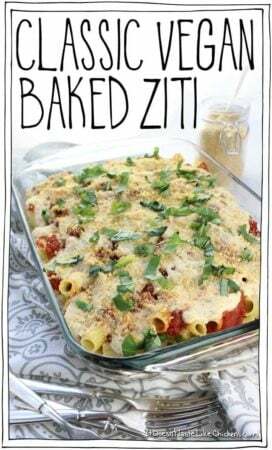 This recipe for Classic Vegan Baked Ziti is sponsored by Muir Glen who I love for their organic canned tomatoes that taste delicious straight out of the can. Seriously! Oh hello, did you want me to introduce you to my soulmate? It’s called Classic Vegan Baked Ziti, but I like to call it my one true love, for short. 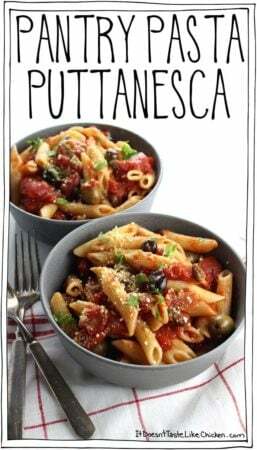 Oh yeah, I’m feeling sassy about this recipe as it’s just the perfect baked pasta dish you ever did see, and more importantly taste!! 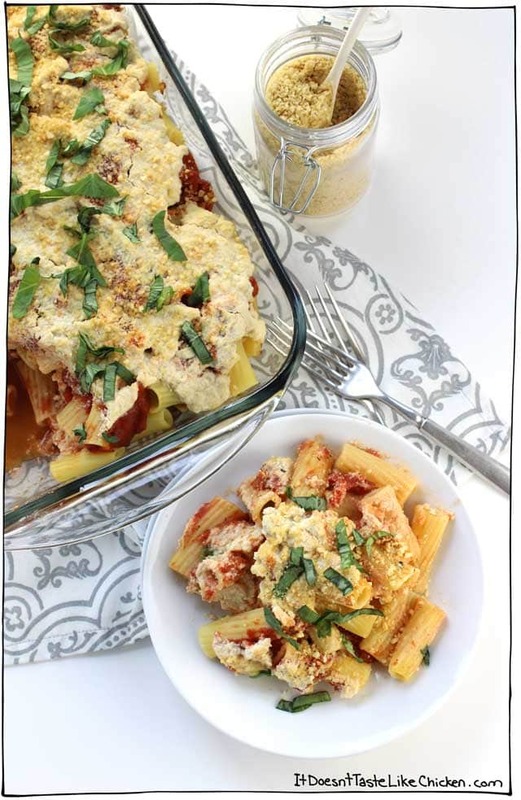 Ziti pasta is layered with a simple homemade tomato sauce and my Quick Vegan Tofu Ricotta. Sprinkled with Parmegan and fresh basil. It’s simple, delicious, classic, hearty, amazing, and you’ll be going back for seconds… and thirds. There are a few layers to this dish, but both the tomato sauce and tofu ricotta can be made ahead of time to make assembly quick and easy. 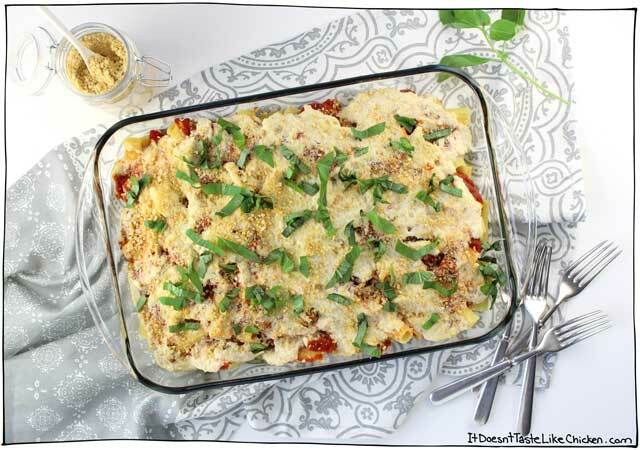 This is the perfect pasta bake for a dinner party, special Sunday dinner, potluck, or just a night when you feel like you need to good ol’ fashioned home cooking. A good pasta dish always tastes like home to me. 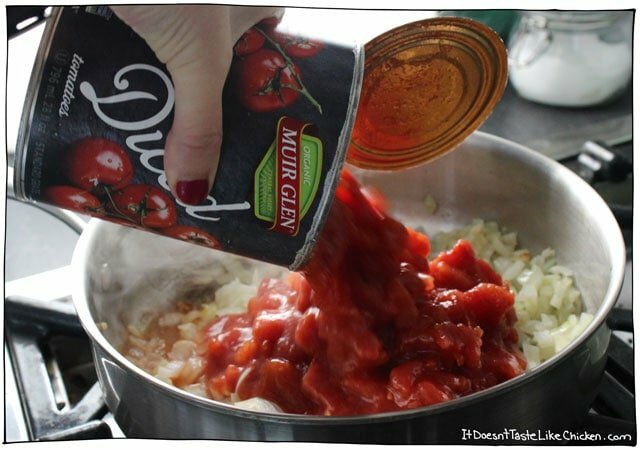 I grew up in a family where having cans of tomatoes in the cupboards was an absolute staple as you never know when a craving for pasta would strike (which was most nights, because, pasta). So I have tasted a lot of tinned tomatoes in my life. Once cooked, the tomatoes taste fine, but usually when you taste the tomatoes straight from the can they have an odd tinned tomato taste. Does anyone know what I am talking about here? But I had a magical moment when I was cooking up this dish. 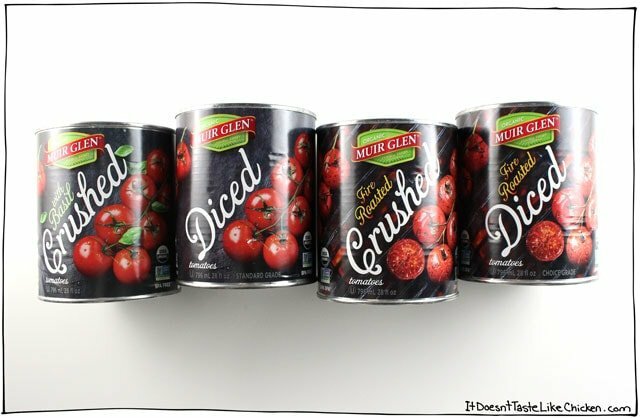 I opened a can of the Muir Glen diced tomatoes and tasted them as I taste everything I cook with, and oh my… they were delicious! Straight out of the can. I was so surprised that I actually had a second and third taste. And this is coming from a girl that doesn’t even really like raw tomatoes that much. Yeah, they’re good. I definitely recommend taste testing some Muir Glen tomatoes for yourself. Find Muir Glen products in the natural foods section at all Sobeys, Whole Foods and most Loblaws stores. Now onto the pasta bake! 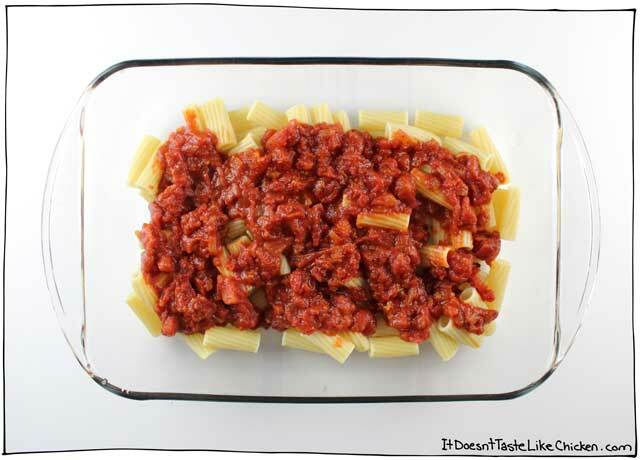 To make Classic Vegan Baked Ziti: start by making the tomato sauce. Heat the olive oil in a large skillet over medium-high heat. When hot, add the onions and garlic and sauté for about 5 minutes until the onions turn translucent and just begin to brown. Add the diced tomatoes, crushed tomatoes, parsley, basil, oregano, salt and pepper. Bring to a simmer and let the sauce cook, stirring occasionally for about 20 minutes until the sauce has thickened and the tomatoes are cooked. In the meantime prepare the tofu ricotta (if not prepared ahead of time) and cook the pasta according to the package directions until al dente. 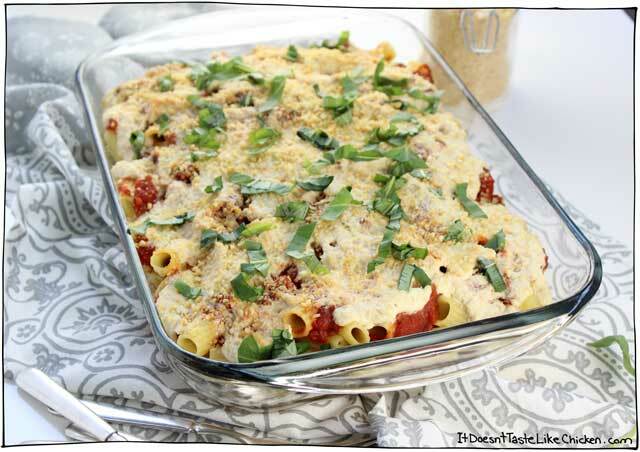 To assemble the Classic Vegan Baked Ziti, add half of the cooked pasta to the bottom of a 9″ x 13″ baking dish. Pour over half of the tomato sauce. Then dollop on half of the tofu ricotta. Repeat with the remaining pasta and tomato sauce. 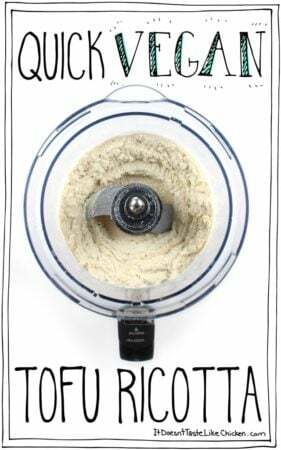 Stir 3 – 4 tablespoons of water into the remaining ricotta to make it easier to spread and smooth it over the pasta and tomato sauce. Top with the Parmegan. Bake covered with foil for 15 minutes, remove foil and cook another 5 – 10 minutes until lightly browned and hot all the way through. Garnish with fresh basil before serving if desired. SO PRETTY, SO SCRUMPTIOUS! This delicious pasta bake is layered with a simple homemade tomato sauce and my an easy vegan ricotta recipe. Perfect for a dinner party, special Sunday dinner, potluck, or just a night when you feel like you need to good ol’ fashioned home cooking. 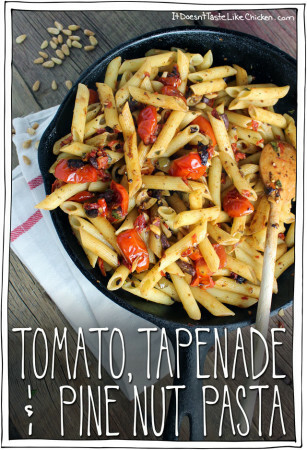 To make the tomato sauce: Heat the olive oil in a large skillet over medium-high heat. When hot, add the onions and garlic and sauté for about 5 minutes until the onions turn translucent and just begin to brown. Add the diced tomatoes, crushed tomatoes, parsley, basil, oregano, salt and pepper. Bring to a simmer and let the sauce cook, stirring occasionally for about 20 minutes until the sauce has thickened and the tomatoes are cooked. To cook the pasta: bring a large pot of water to a boil and cook the pasta according to the package directions until al dente. 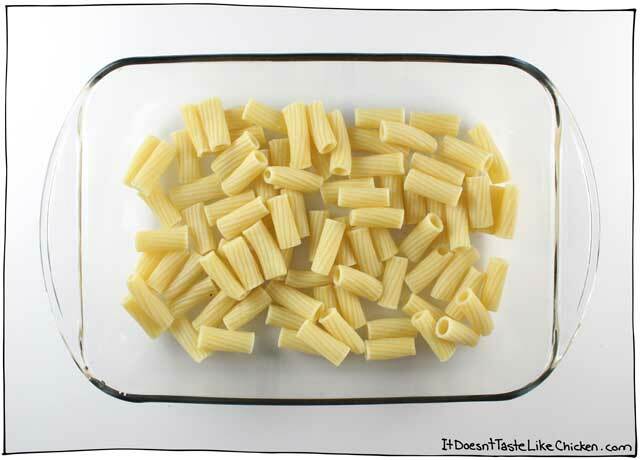 To assemble the pasta bake: Preheat your oven to 375F (190C). 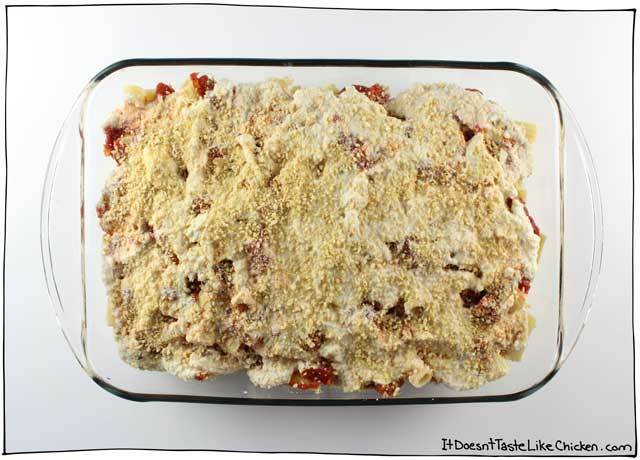 Add half of the cooked pasta to the bottom of a 9" x 13" baking dish. 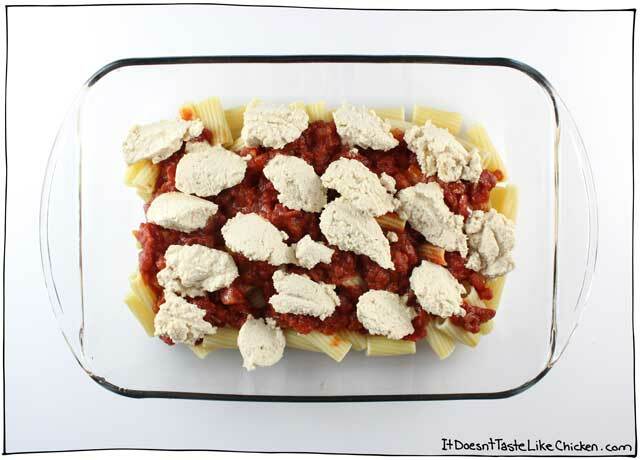 Pour over half of the tomato sauce, and then dollop on half of the tofu ricotta. Repeat with the remaining pasta and tomato sauce. Stir 3 - 4 tablespoons of water into the remaining ricotta to make it easier to spread and smooth it over the pasta and tomato sauce. Top with the Parmegan. Bake covered with foil for 15 minutes, remove foil and cook another 5 - 10 minutes until lightly browned and hot all the way through. Garnish with fresh basil before serving if desired. I can’t find Muir Glen tomatoes in the UK can I use any organic tomatoes? Absolutely! Any diced and crushed canned tomatoes will work just fine. You could even use fresh tomatoes and dice and crush them yourself. Enjoy! I made this tonight. It was so good! Awesome recipe Sam! This was such a perfect ziti!! My husband literally licked his plate clean 😀 I added some gardein beefless crumbles and chopped mushrooms to the tomato sauce per his request, but followed the recipe exact otherwise. 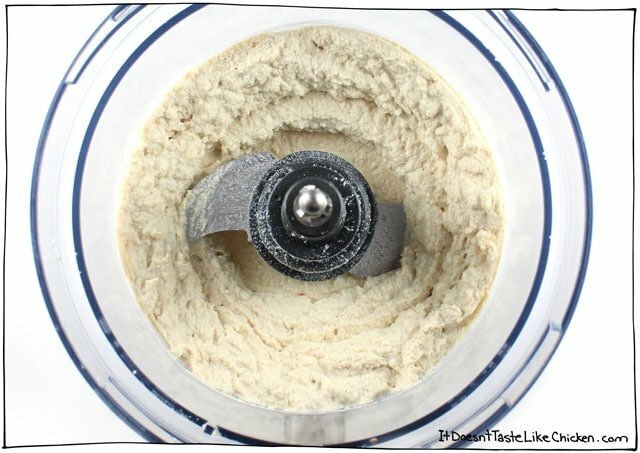 Thank you for such a simple and comforting recipe! Absolutely DIVINE! Loved every bite. Would like to leave a 10-star rating if possible. Am definitely going to take this to the next church potluck and start converting them all. Thank you SO much, Sam! I made this for dinner tonight for my daughter and granddaughter, we all loved is. Absolutely delicious. Holy carp, this was awesome!!!! A great meal for everyone including the 4 year old girl (who is a pasta monster) and the 9 month old boy (who just loves eating anything he can, despite only having 3 teeth). 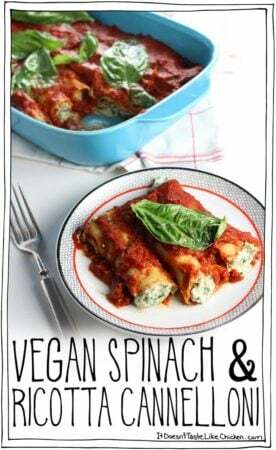 This would be a great meal to “wow” the unconverted! 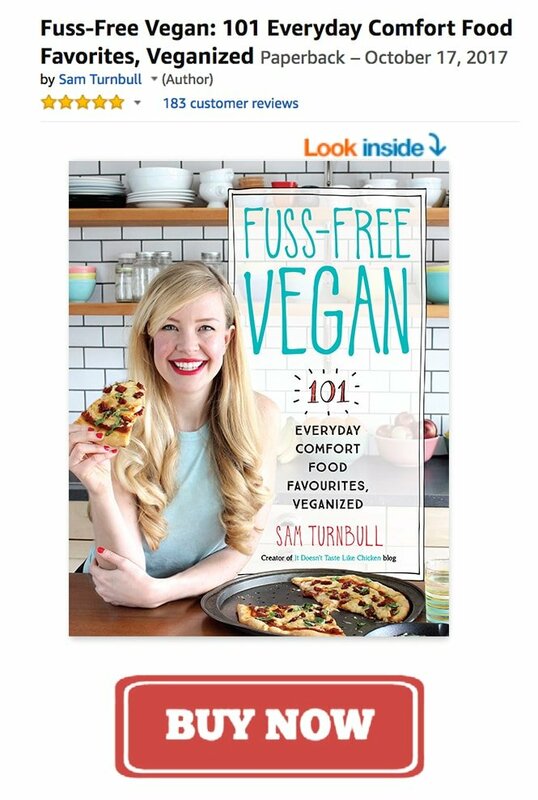 Thanks for all your great recipes and inspiration, Sam. 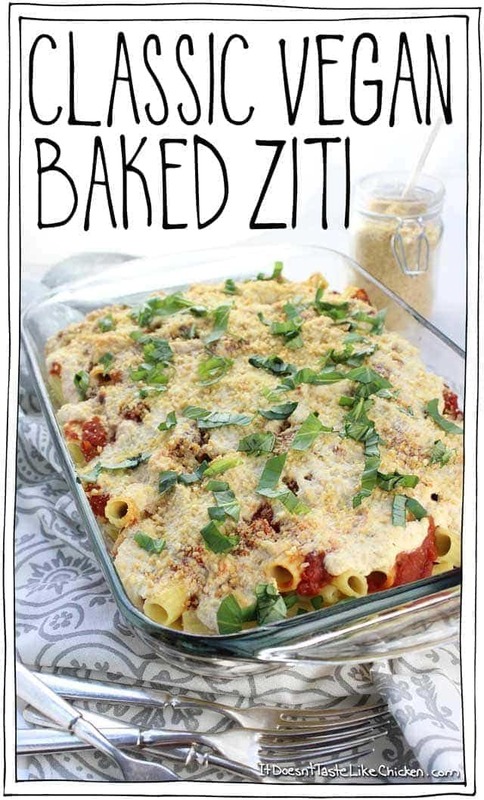 I don’t know, you see Vegan Baked Ziti is MY one true love! 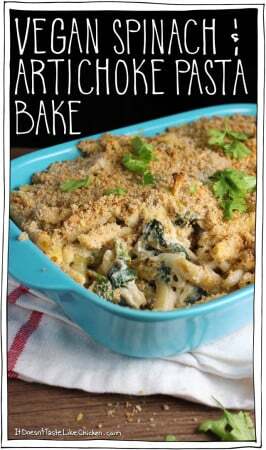 It is my most favorite casserole to make, and now I get to try YOUR recipe – YAY! And actually, Italian main dish foods have been my favorite since childhood – my mom made the best spaghetti and meatballs, and now I make my own meteballs buy get vegan from the store freezer. As always – you continue to rock! Haha! Aww shucks, thanks so much, Ann! Tofu changes texture pretty dramatically when frozen, so the ricotta might go funny. 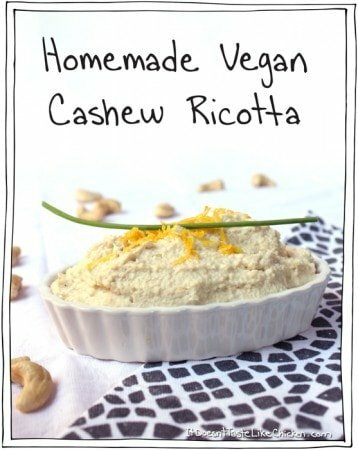 You could try using my Cashew Ricotta instead which might freeze better. The book comes so soon now, I’m excited too!! Oh Sassy One, this looks fantastic!!! Can’t wait to try it.